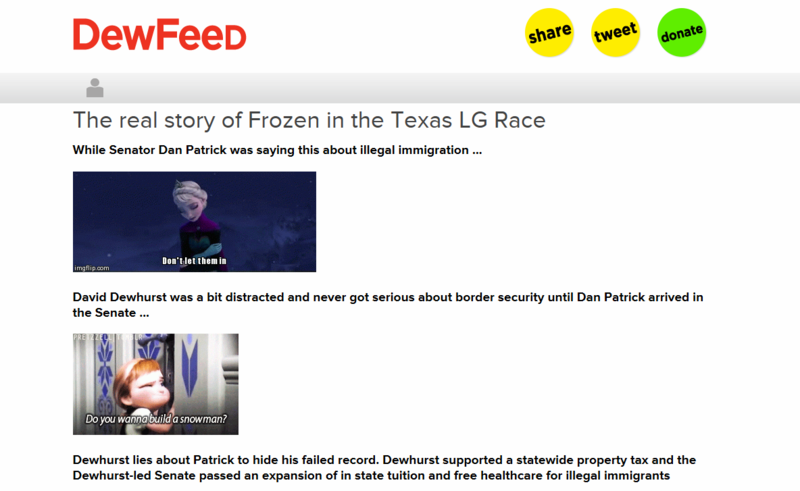 "Frozen" is featured prominently by both the David Dewhurst and Dan Patrick campaigns. Just when you thought you've seen it all in the Republican lieutenant governor runoff. 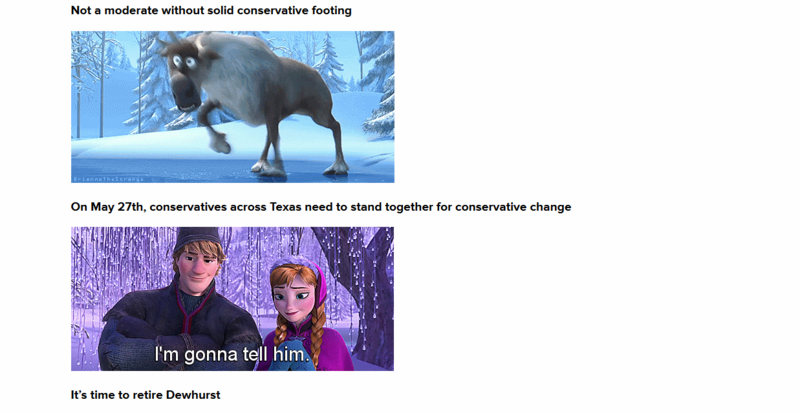 The ongoing battle between David Dewhurst and Dan Patrick took a creative twist Wednesday -- and it's all inspired by Frozen, the hit Disney movie that features the hot song "Let It Go" and the Norwegian princess with icy powers. First, the Dewhurst campaign posted a YouTube video that features Patrick lip-synching to a version of “Let It Go." Then Patrick unveiled a post on its DewFeed page, a site that resembles BuzzFeed, complete with animated Frozen GIFs. The video, “The Ballad of Dannie Goeb,” focuses on Patrick's name change and bankruptcy. (Patrick filed for personal bankruptcy in the 1980s, walking away from $800,000 in debt.) It features a shirtless Patrick covered in paint – film from decades ago. Dewhurst, the lieutenant governor, faces Patrick, the state senator from Houston. Patrick leads in the polls. Patrick was born Dannie Goeb, but began using Dan Patrick in the late 1970s as a sportscaster. He then legally changed his name in 2003. Patrick explains this on his website. 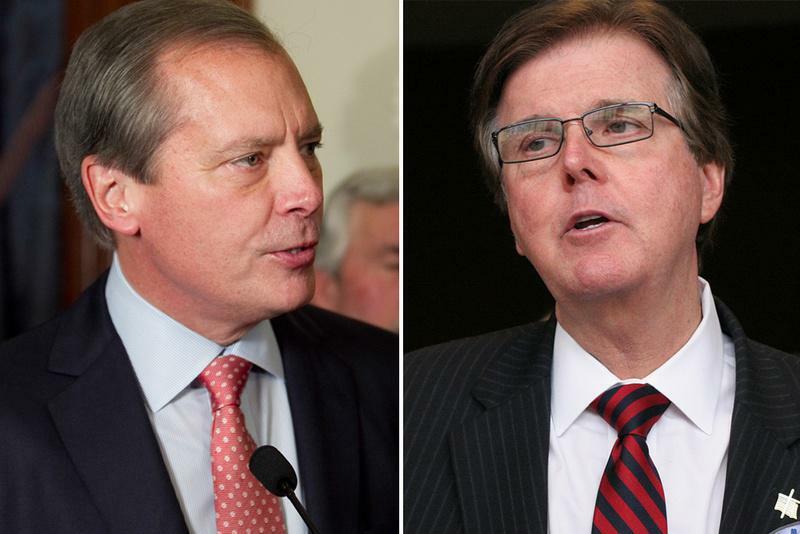 Earlier TV attack ads from Dewhurst claim that Patrick didn’t pay taxes, pocketed employees’ federal income tax withholdings and hid assets during a bankruptcy. Politifact Texas has fact-checked an earlier claim from the Dewhurst campaign that Dan Patrick "’changed his name from Danny Goeb to hide from’ his ‘debts.’" Politifact Texas awarded the ad with its "pants on fire" label, declaring: "David Dewhurst lofts ridiculous unsupported claim about Dan Patrick legally changing his name to hide debts." Dan Patrick's campaign responded with a BuzzFeed-style posting on its DewFeed website. 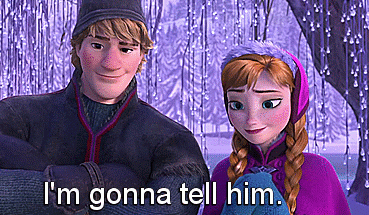 Here's an excerpt from the "Frozen"-themed attack ad, animated GIF style. Dewhurst sat down with KERA's Shelley Kofler earlier this week to talk about his campaign. “All we’re doing is we’re quoting things he’s said, things he’s done, from newspapers, from TV shows,” Dewhurst told KERA in defense of the hard-hitting ads, which Patrick claims are filled with lies. Patrick reminds us that Dewhurst also went through a bankruptcy in the 1980s. Patrick has said he learned from his mistakes and now has a successful broadcasting business. He’s blamed his old financial troubles on a tough economy and suggested it’s not relevant to pick on him for things that happened 30 years ago. 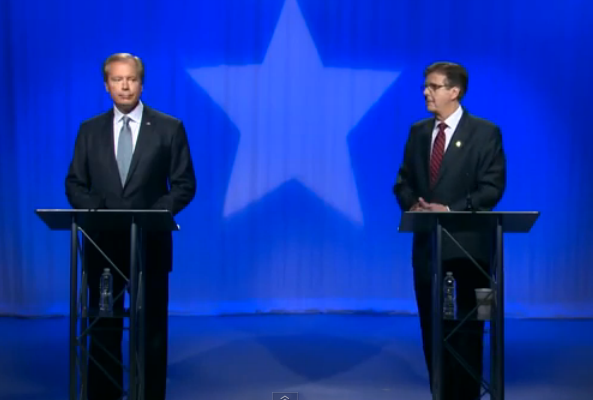 Patrick and Dewhurst faced off in a contentious debate in Dallas on Wednesday morning. Watch that here. Or catch up on their debate from last Friday in Houston. The runoff is May 27. The gloves came off Wednesday during a lieutenant governor's debate in Dallas. The ad wars in the race became the focus of the last scheduled media debate between incumbent David Dewhurst and Dan Patrick, the state senator from Houston. One of them will become the GOP nominee on May 27. After finishing second in the Republican primary, Dewhurst has spent millions on TV attack ads questioning Patrick’s 1980s bankruptcy -- and his character. KERA has invited both Republican candidates for lieutenant governor to our studios to discuss their qualifications for the job and their visions for the state. 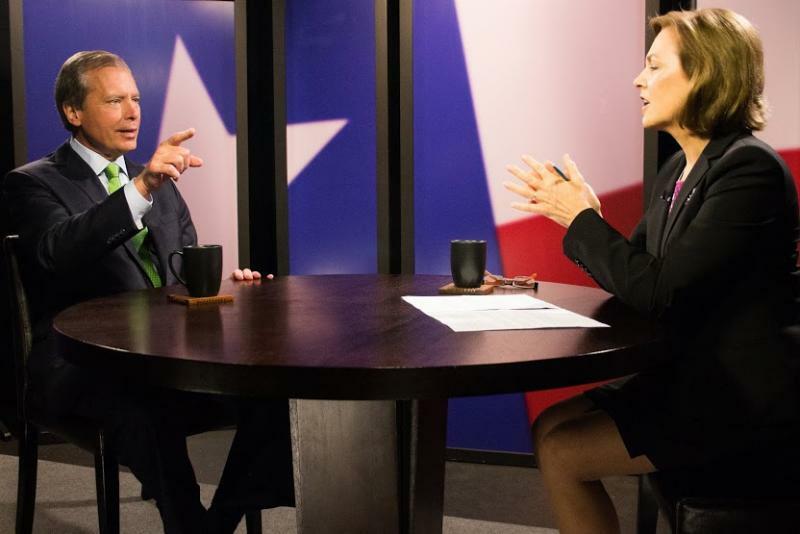 David Dewhurst, the incumbent, sat down with KERA on Tuesday, on the eve of the last scheduled media debate before his May 27 runoff election with Dan Patrick, the state senator from Houston. Because of a satellite problem, the KERA-TV feed of Friday night's Republican lieutenant governor debate switched to Spanish midway through the debate. You can see the full English-language version of the debate between David Dewhurst and Dan Patrick below -- it will also re-air Friday at 9 p.m. on KERA-TV (Channel 13). Lieutenant Governor David Dewhurst got some good news this weekend in his uphill battle to hold onto his job. A former foe, Land Commissioner Jerry Patterson, told KERA he will be endorsing Dewhurst. 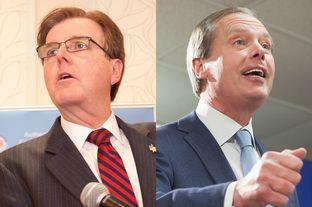 The news comes two days after Dewhurst, the incumbent, and Dan Patrick, the frontrunner, debated in Houston.